Further to my previous post, and as mentioned in Part 1, there are lots of different UI approaches to creating editable tables. 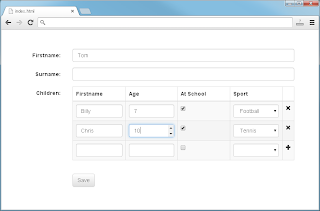 For example: a table where you click an edit button next to each row to open a pop-up window; a table where you click the row itself to open a pop-up window; a table where you click each row and edit it 'in place'; a table where all rows are editable at once; a table where each row has both an edit button and a delete button; etc. etc. I'm sure you can think of plenty more. All of them are valid choices depending on your UI design. It's because of this that Metawidget doesn't try to 'own' your UI. Metawidget only strives to be a piece of your overall solution: a useful widget you can sprinkle liberally all over your UI, wherever you need UI generation, but nowhere that you don't. You can download a complete example here. Feedback welcome! Hi, I'm trying your example and I found it very interesting. Is it possible to pass dynamicaly with some variable the schema of json structure after the attribute "properties" ? How can change the width column in table passing the value of size dynamically ? Yes, this is possible. Metawidget features a flexible, pluggable Inspection layer so you can plug-in whatever inspection results you want. Great this is awesome, i'm going to try soon. Can you have a look to my code in this plunkr. The problem is how can represent value in a table from differents format of json. Can you please create a working test case for me to examine? I've corrected the plukr with my test case. Ok i solved it with a little workaround. Now i have to fix the way to remove the label "Row:" before the table. Ok I solved it with a little workaround as you can see here in the new plunkr. Now I just only fix the way to remove the label "Row:" before the table. The label is coming from the TableLayout. So in your Plunkr, instead of 'layout: _tableLayout' try 'layout: new metawidget.layout.SimpleLayout()'. 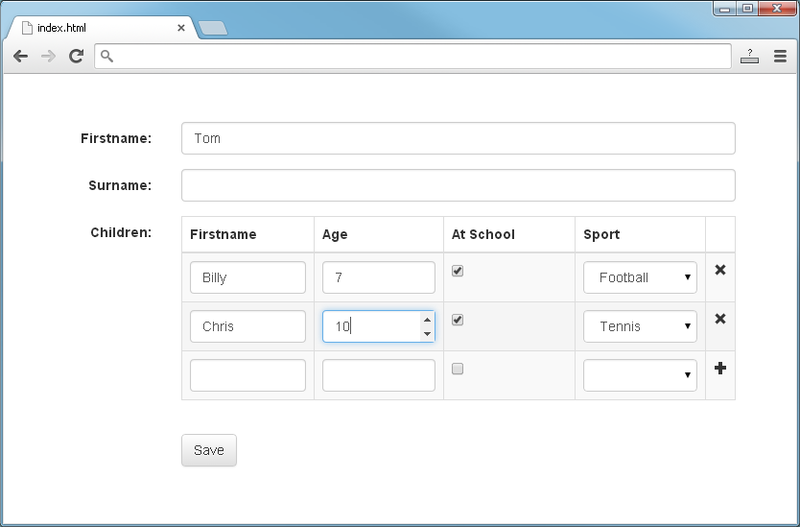 Or, if using Metawidget 3.9 (just released) you can add 'title: null' metadata to the 'row' property. TableLayout will take this to mean you don't want a label.